In COL's JOB Guide, we've got detailed information on more than 500 Australian job descriptions. And while we can't possibly include information on all those jobs, we've roundup up a "small" collection of 500+ of the more "common" jobs for you to have a close look at. As well as providing you with detailed job information, COL's Job Guide is designed to make you start thinking about a much BIGGER range of jobs! And then you have a much better chance of finding a job vacancy which suits you. Because to make a well-made career decision, it is very important that you find out as much information as you can, about as many jobs as possible. 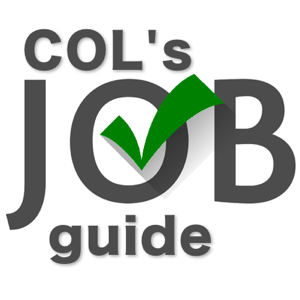 Find out more about COL's Job Guide.